Laura, a London-based American vacationer, and I were snorkeling the sardine bowl in front of Seaquest Dive Center but had to bail due to stinging jellyfish infestation. Rudy, Seaquest's longtime dive master was preparing for a scuba dive at Pescador Island for a guest when he invited us to come along as well. Why not? Pescador Island is practically a pencil-shaped island sticking out of the ocean floor going down beyond 40m. It has a vivid coral reef in the shallows for snorkelers, a vertical plunge into the deep blue for freedivers and its walls offer a visual parade of sea creatures to scuba divers. 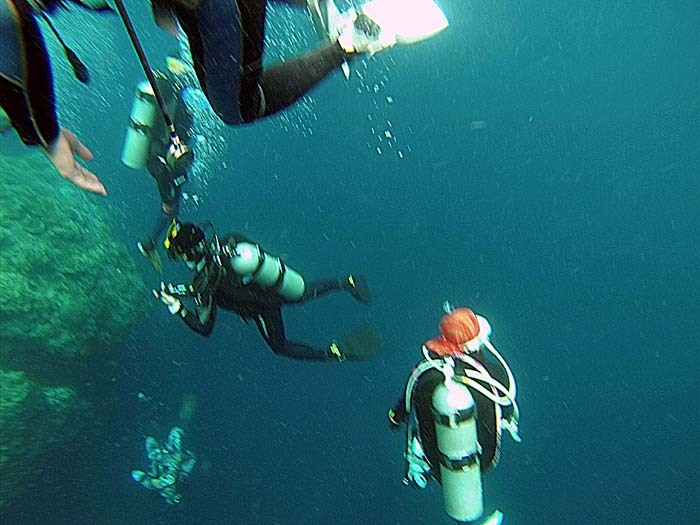 You can't get enough of Pescador Island, just a stone's throw from the main Moalboal peninsula. 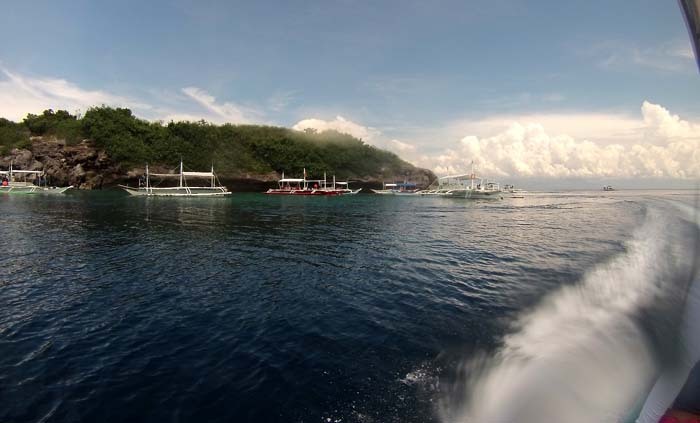 We boarded a speed boat (instead of a noisy and sluggish pumpboat) to Pescador Island. We were there in a jiffy! I asked Rudy if it was safe for me and Laura to snorkel/freedive around the island - that there is no section where an ambush current will sweep us out into the sea. He assured us it was safe. And off we went into the water. Laura and I were comfortable just being by ourselves - no guides needed. The coral reef in the island is still pristine, notwithstanding the amount of human and boat traffic. Where the island shines is the sheer vertical drop-off just meters away from the shallows - there were no gradations. 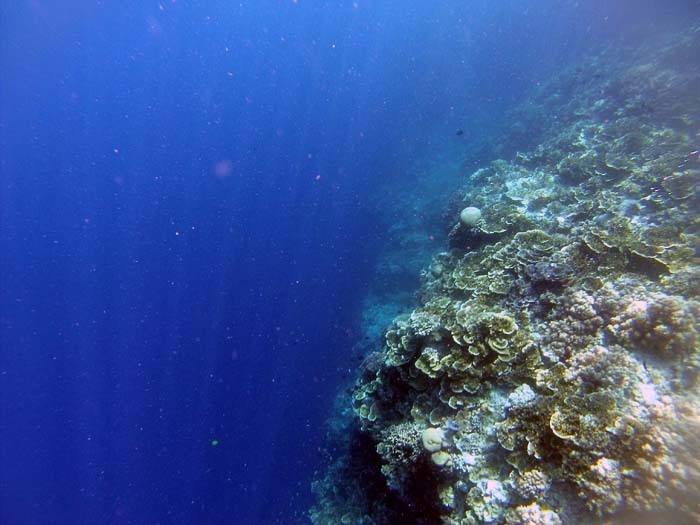 Sometimes, it's an overhang, you have to swim beyond the edge and into the deep blue area to see what lies on the wall. Visibility was clear you could see the scuba divers down below. I made a few attempts to go down their depth (15m?) and savour a concealed glee seeing the panicked-look on their faces as they see me and think they've gone up too fast into the shallows! It was a weekend so I anticipated a crowd. But nothing prepared me for the pandemonium! Between all the boats anchored around the island like ants around a drop of honey, all the snorkelers clustered around their boats and all the scuba divers ascending/descending from their boats, it was rush hour traffic where we had to snake our way between boat hulls, snorkelers and divers. I've never experienced anything like that before. While moving underwater, I could see many of the snorkelers standing firmly on the corals like these corals were step-stools! 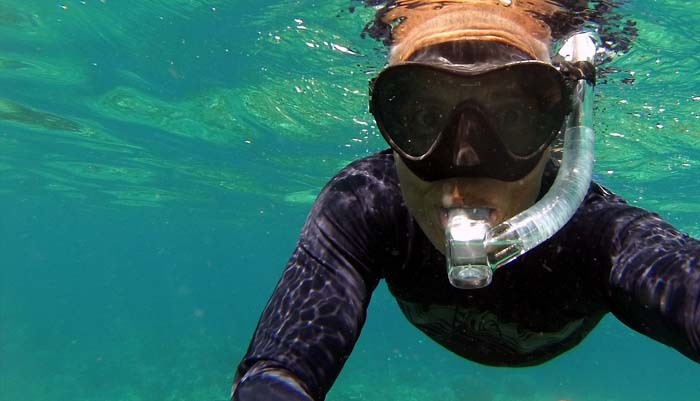 The snorkeling guides turn a blind eye and allow such things to go unabated. 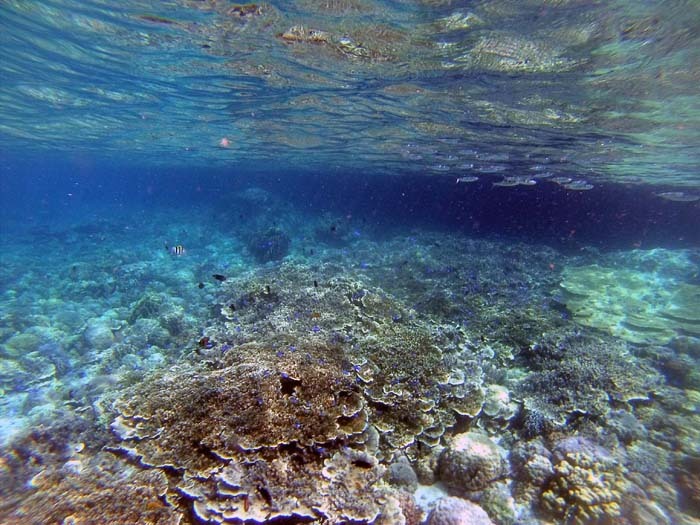 Given such heavy human traffic and a lot of these people trampling on the fragile corals, it won't be long before the shallows of Pescador Island are reduced to rubble. Laura and I were close to circumnavigating the island until we came upon a section with strong current. It was still manageable, but it would wipe us out to swim against it, and we still had no idea how far the boat was. It felt prudent to turn around. 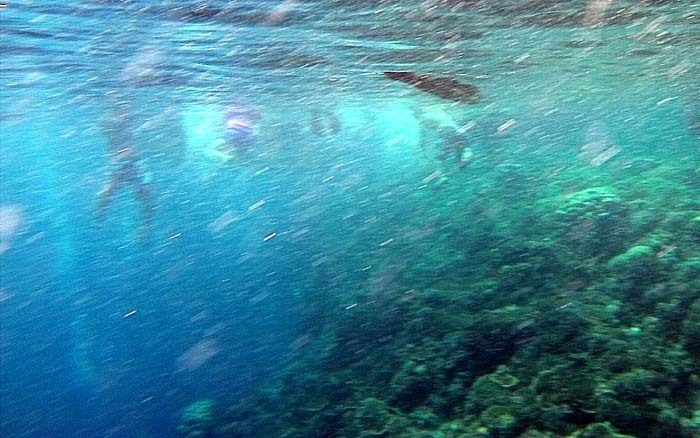 We had to go through the gauntlet of snorkelers, boats and divers again! By the time we reached the boat, Rudy and his guest were also just about done, so the timing was great. 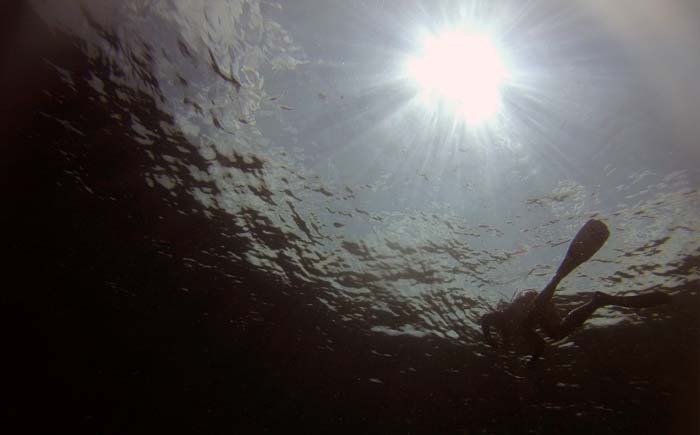 There were so many highlights about this snorkeling/freedive. 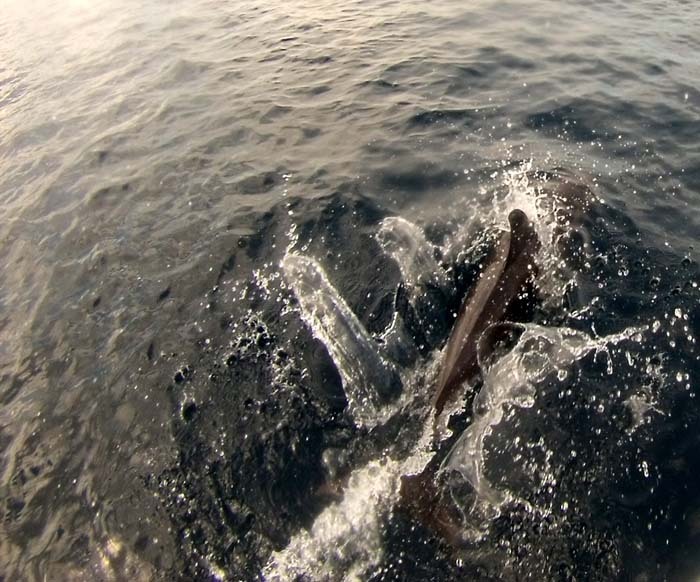 The vertical plunge into the deep blue conjured equal excitement and awe. The rush hour traffic between divers, snorkelers and boats was an interesting experience although I wouldn't want to go through it again. The circumference of the island being small enough to dive around was also an added challenge. 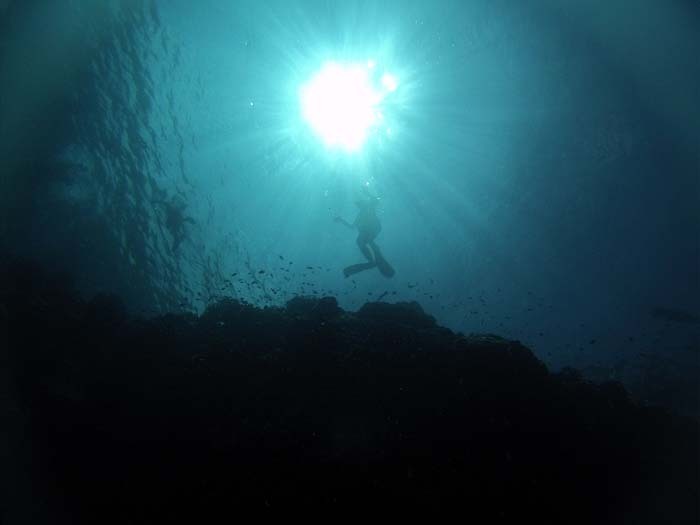 I would say a dive into Moalboal isn't complete without a visit to Pescador Island. The only lowlight I observed was snorkelers using corals as step stools. These people don't know any better. The guides and the resorts ushering these guests should conduct an orientation first to educate their guests how to be responsible about the fragile eco-system. These stakeholders are killing their own industry by chasing the money without regard to the environment. Thank you Rudy and thank you Seaquest Dive Center!